iLoveToCreate Blog: The Ultimate Crafter! I guess it's official when you get a trophy, right? 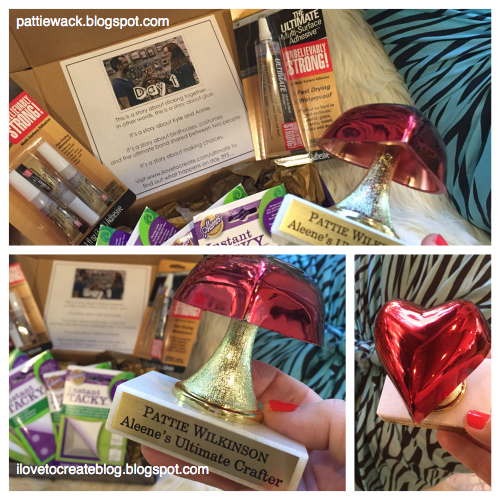 Imagine my surprise to get this box of goodies from iLoveToCreate with my favorite brand of adhesives, but also a trophy with my name on it with a big bright red heart! And now I have some great new glues to add to my stash, and create some fun and amazing projects to share with you.... my crafty, gluey family. You've heard my motto before..."if you don't glue, I don't do it" and so away I go, on to another mission to find that perfect thing to glue....because it's what I do!